Things at Byzantio, a seaside taverna in the port of Merichas in Kythnos, are simple. 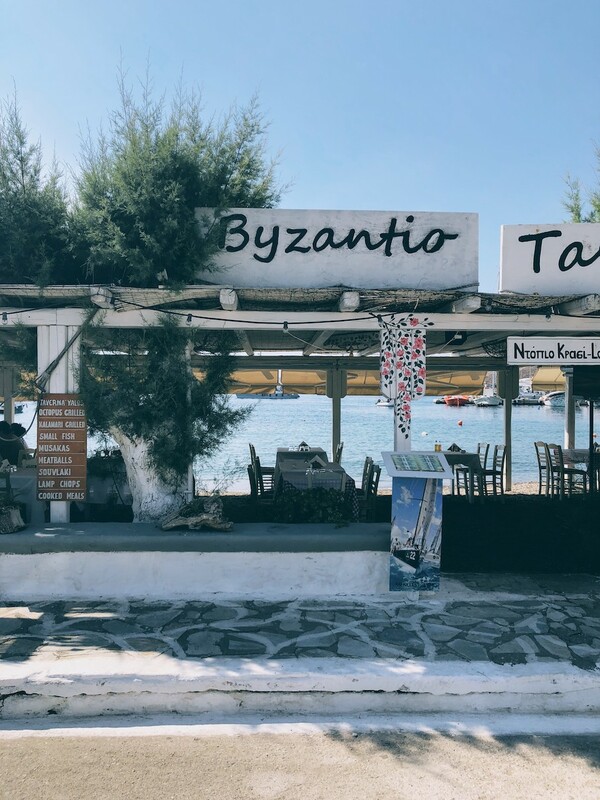 A convenient location next to the port and the calm sea, a simple menu and a casual downtempo ambience enough to cater for your post-beach appetite. The taverna is run by a bunch of young chaps from Trikala and is famed for their shrimp pasta, served in the saucepan. Their menu is quite simple featuring the standard taverna offerings but also both seafood and some meat options. And if that's not enough, some giant-sized octopus hanging out to dry in their small garden in front of the entrance will definitely do the trick. So, all in all, a great choice for everyone! Although the sun is not forgiving during the late hours of the afternoon, a post-beach visit is highly recommended when the place is kind of quiet and the service is better than at night. Their zucchini fritters are very good and quite chunky with some strong bites of zucchini and a crispy texture too! Their marinated anchovies are also very good, matured in virgin olive oil and served on their own just as they ought to be - no fancy decoration. And their Greek salad is also very tasty served in the signature ceramic bowl of Kythnos. Finally, their shrimp pasta is quite good, balancing the right mix of tomato sauce and featuring fresh and nicely cooked shrimps.